Where your imagination can sour! Much has been said of the developer's perennial quest to create an immersive world--the cliched "living, breathing world". Of course, one item on that agenda includes the NPCs that populate said world, and presumably are doing the living and breathing. In this series, I take time out of playing a game to follow around a single NPC, observing the actions of that character for a single in-game day. The character is chosen randomly from those that populate the environment but do not directly tie into the quest or narrative experience. The idea is to see how well crafted the illusion is. Does it hold up under scrutiny? I direct John Marston into Armadillo in the dead of night, hitching up his horse just outside the saloon. As John approaches the saloon, a man in a bow tie, vest, and bowler cap ambles out of it. I decide he will be the next target of my creepy stalking. I want to make it clear, I have no idea what this character's name is. He isn't one of the guys that regularly loses money at the poker table, nor is he a character that I've engaged in any of the other mini games. However, I'm a sucker for alliteration, so he's now going to be known as Bob. 1:30 AM - Observation of the subject begins as Bob first steps out of the saloon. He walks onto the main thoroughfare and sort of watches as two swaying drinkers talk to one another. He doesn't engage them, but he does scratch himself. After that, he heads onto the porch of the saloon, and leans against the railing. He remains here for some time. 4 AM - Bob stops leaning on the rail, and says something about an Elly McGregor (?) to no one in particular. I didn't catch exactly what he said. After this outburst, he moves back into the Saloon, and leans against the wall looking out a window (at basically the same scenery he was looking at from the railing of the balcony). 5ish AM - Bob heads back outside, sits on the stool on the porch for a few minutes before returning to leaning on the railing. The stool was directly between the window and the railing, or thereabouts. 630 AM - Bob leaves the area of the saloon, heading to the upstairs balcony above Armadillo's gunsmith. He repeatedly plays an animation that I can't quite identify from my position on the ground. He could have been coughing, shouting, spitting, playing a harmonica, or shadow boxing. After this, he wanders over to the door up there and knocks on it a few times. He gets no response, so he casually leans against that railing, as a change of pace from leaning against the one on the saloon's porch. 7 AM - Bob asks the question that's been on everyone's mind, "When we gonna stop talking, and start drinking?" He hasn't done much talking, and doesn't seem inclined to actually start drinking either. 7:15 AM - Bob crosses the street to the little "produce" stand next to the general store. Apparently he works here. He starts butchering chickens. This is how he got his nick name above. I was actually pretty surprised (pleasantly) to be given the impression that he might have some sort of schedule (reinforced over the course of the day), but his attire seems a bit odd for a butcher. I'm not positive that this is really his job, and think that perhaps a random NPC in town takes it each day? I'd have expected to see one of the apron wearing guys over here. 9:15 AM - Bob takes a break from butchering chickens to steal an Apple from work, which he eats on the spot. He discards the remnants, which seem to actually be physically simulated and roll around the environment. 9:25 AM - Bob goes back to work. 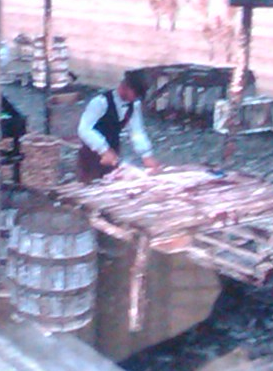 I immediately get kind of grossed out thing about his lack of sanitary butchery practices. No handwashing between raw chickens and eating the apple? Yikes! Also, that table doesn't look like it's been washed, ever. Also, he seems to have a barrel of raw unbutchered chickens, a barrel of chicken feet/heads, and a barrel of raw butchered chickens. One of the many moments that I'm glad video games don't have smellovision technology. Noonish maybe - He is still butchering, but I've decided to crunch some numbers. I time a single chicken, and it takes approximately 5 in-game minutes. So 24ish chickens before his apple break, and maybe 33 more or so since. Those barrels are like Mary Poppins' bag. 5 PM - Approximately 60 chickens later (total, approximately 117), Bob takes another apple break. He goes right back to work afterwards. I briefly consider the possibility that NPCs in Red Dead Redemption have needs to satisfy, but ultimately don't think so. 6 PM - After essentially an 11 hour day of nonstop work (and approximately 127 butchered chickens), Bob heads over the saloon, to lean against the rail at his favorite spot. 7:30 PM - Bob heads inside to the saloon window, wanders around inside a bit after that, then returns to leaning. Maybe 25 in-game minutes. Midnight - Bob exclaims (to me?) "You look like you got run over by a wagon!" He heads back inside to look out the window at the spot he just left. 12:40 PM - Bob sits on a stool inside the saloon, against the wall opposite the bar, facing inward. This lasts just a few minutes. 1 AM - Bob heads back outside to lean. He remains there until the 24 hour observation period is over. On the positive side of things from observing Bob, his working a job and his eating were both boons to realism. When I had passed through Armadillo and other settlements previously and seen NPCs working, I had just assumed that they spawned into that position, and would remain there until I went far enough away that they despawned. Seeing someone start and quit their job was nice. Additionally, while Bob was a bit boring during his off period, I did see a number of other NPCs do relatively interesting things. Some of the folks drinking at the bar got stumble-around-and-fall-down drunk (awesome animations on that, by the way). Some other NPCs seemed to start and stop conversations with each other. A deputy (non-story) taunted a drunk at one point in the night. On the other hand, he never slept all day, and he worked like a robot. And quite frankly, for a guy who spent nearly every non-working hour at the bar, he didn't really do much. Perhaps he's haunted by his lost love, who he last saw from the porch of the saloon. We'll go with that. She's an aggressive, straight, tough, unfriendly chick who absolutely hates me. She likes the Furniture Graveyard (apparently a building in town), she likes the Bloodstone Tombs, and she likes Pretty Necklaces. She dislikes the Bloodlust Roar. All this info comes directly from her profile in game. My character takes up a position at a respectable distance, from where he will observe her actions creepily for the next 24 hours. Midnight - 2 AM - Mandy paces around the interior of the bar. She occasionally stops in positions (observation reveals them to be at least partially non-random). She doesn't take any particular actions in those places, even when she stops directly at the bar, facing the bartender. 2ish AM - Mandy walks outside, and generally continues the same sort of behavior on the patio. At some point, she talks to Kyle the Thug, telling him something like "Every Friday night without fail you'll find me at the pub. Unless I stay home." He responds by taunting her: "What kind of a beast are you? Surely not a lady!" 4ish AM - After pacing about randomly for awhile, Mandy stops on the edge of the waterfront staring out over the harbor. She appears to be watching the moon set. 6ish AM - I thought for a moment that Mandy was going to leave the area of the bar, as she was heading up a path to the next level of the town. Perhaps she was going to go home after a night of not-really-drinking. She fooled me though, and just paused a bit up the path before returning to the bar's patio. Around this time she also exchanged inaudible taunts/insults with Leyla the Thug (I could tell it was an unfriendly exchange due to the animations that played). She also chats with Dave the Thug, but I am too far away to hear that exchange either. 8ish AM - She's back on the edge of the waterfront, this time watching the sunrise. This is among the most convincing of her behaviors, particularly since it has been timed with great views of the moon and sun so far. Also, it just made me realize that I'm pretty sure the moon set on the same side of the sky that the sun rose on. 9ish AM - She tells Kyle the Thug that he can find her at the pub every Friday night (again). He responds by telling Mandy to get back in the kitchen. This isn't the first time that I wonder if the two are married in the game, but the only way I can think of to verify that involves having my character try to sleep with Mandy right in front of Kyle, which would interfere with the experiment. 11ish AM - She's wandered back inside the bar. She stands at the counter, right in front of the barman, but doesn't speak or play any animation. Honestly, this would creep me out if I were the barman. 1ish PM - Chris the Traveler enters the bar, encounters Mandy, and uses the same insult that Kyle used previously. She doesn't dignify it with a response. 3ish PM - Leyla the Thug is back. No insults this time, instead Leyla says "The Reaver can have me as often as he likes, and he does!" Mandy responds with "Very Mysterious..." Personally, I didn't find much mystery in the comment. 4ish PM - Cathy the Traveler is staggering around drunk and bumps into Mandy. Mandy screams after her "What's the matter? Scared?!" 5ish PM - She exchanges inaudible taunts with Vikki the Thug. 6ish PM - Mandy wanders back into the bar for just a few minutes before wandering back outside. 8ish PM - She returns to her spot on the edge of the waterfront staring out over the harbor. No celestial bodies doing anything interesting this time. 10ish PM - Ted the Stone Cutter mentions to her that he should get his mother a present. Mandy helpfully points out that there is a "shop in that sells that in town." I think she's referring to the stall that is pretty much right next to them (closed at the moment). Near to midnight - After nearly 24 hours of avoiding direct interaction with Mandy, she finally spots my character and starts Boo-ing. I look at this as a decent time to call the 24 hours of observation over. After watching her for a day, I actually wonder if random chance might have gotten me a very boring NPC, or if any of them would have been so dull under this intense scrutiny. Of the various characters she interacted with, both Kyle and Leyla were also in the vicinity the entire time. On the other hand, Chris, Cathy, and Ted definitely came through from elsewhere and then moved on after a time. Ted was presumably working at his stone cutting stall at some point. While there were a few interesting interactions between Mandy and other townsfolk, I never saw her doing anything else beyond walk around and pause. For someone who spent all day in the vicinity of the bar, she never drank or ate anything (I did see one NPC sitting at a table with a drink). I've seen NPCs entering/leaving their houses, and I've seen or heard them in their houses sleeping or eating or talking to family members. Mandy did none of this. I guess that gets to the point of this series though. As I do this with other games, I pretty much expect that none of the NPCs are interesting when watched this closely, and the moments of entertainment they provide during normal gameplay exist only because they are in the background. On the other hand, I think there's something to be said for creating a strong enough simulation that it remains compelling when brought to the forefront. In any case, the next game I'll cover will probably end up being Red Dead Redemption. Here is the article I mentioned in class. It's two years old. Extra Credit points to whoever can find updated information on the situation. I'm pretty interested and haven't found anything yet. Also: We didn't get around to chatting about it in class, because I wanted you to have some time to get together with your groups, but don't forget to consider the implications of non standard orbits, axises, and rotations. Consider Uranus, so tilted as to be pretty much perpendicular to it's revolutionary orbit. Consider the distance of your world from it's star, and how long it takes to orbit said star. What implications do the orbital lengths/axis tilts have on seasons, and what implications do those, in turn, have to life on your world? Life would be quite different on a planet that went through a winter period that lasted an entire generation's life span!